Mrs. Hester's Classroom : My First PBL Unit - Day 3! Here are Day 1 and Day 2 if you missed them. Both of those days were full block classes, meaning we had 80 minutes. Day 3 was a "fast Friday" schedule so I only saw them for 40ish minutes. When students brought back their survey results, they tallied up each answer choice and then put that data in our shared class spreadsheet. Here is an example from one class. I projected the spreadsheet so all students could record their important information. We recorded data on page 124. I showed this... as a reference. 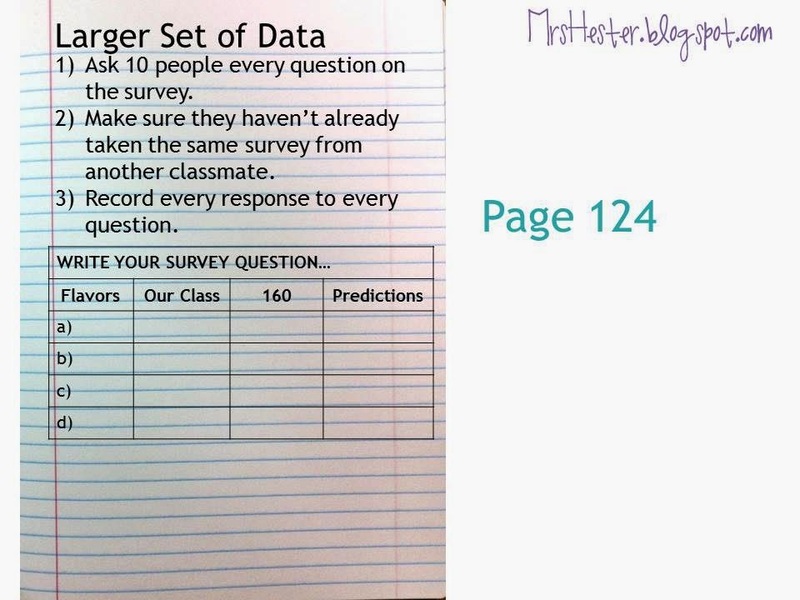 We talked about if our class data was a good representation of the larger group, and how we could then project for an even larger sample size, like our town or state. This took most the class period. Students used the last 10-15 minutes to brainstorm how they wanted to present their final projects. I think a couple groups are going to make a commercial!! I'm excited to see them! UPDATE: Day 4 is here!